Our spine is made up of 33 oddly shaped bones called vertebrae that are connected together with several ligaments. In between each vertebra is a disc called a vertebral disc made of cartilage that prevents banging and rubbing together of the vertebrae in the spinal column. In addition, each of the vertebrae has a hole through which the spinal cord passes. 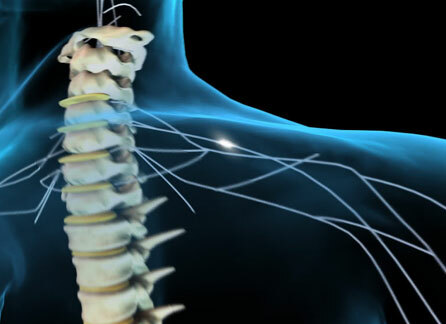 The spinal cord is vital as it carries messages to and from the brain to the rest of the nervous system and it is the spinal column’s job to protect the spinal cord. Over time, the discs between the vertebrae can suffer a great deal of wear and degradation due to the constant movement of our vertebrae as we bend forwards and backwards and twist left and right. This can cause these discs to become bulged or even protrude and often surgery is needed to correct this. Protruding disc surgery is used to correct these discs should they begin to protrude. What is Protruding Disc Surgery? Over time, your vertebral discs can become damaged because of injury, bad posture or weak supporting muscles. Any of these things can cause your annulus, the hard outer shell of the vertebral disc to tear or stretch. The most common outcome of this tear is what is called a protruding disc or what’s more commonly called a bulging disc. A further problem is when the nucleus (the soft jelly-like centre of the vertebral disc) pokes through the tear, much like a hernia, and surrounds the spinal cord or nerve roots. Protruding disc surgery is a surgical procedure performed, usually as a last resort, to fix the protruding disc. A high number of patients suffering from a bulging or protruding disc do not need surgery due to a high success rate in conservative therapy. There are, however, some patients that suffer from chronic pain regardless of the therapy that are good candidates for surgery. During the surgery, which can be either endoscopic or open dissection, the surgeon will carefully remove a small part of the vertebral disc to relieve pressure of the nerve roots that are being pinched or compressed by the spine. Almost all of the protruding disc surgery procedures performed these days are done using a technique called micro decompression spine surgery which uses a minimally invasive surgical procedure where a small incision is made through which a tunnel is inserted. Instruments can then be operated through this tunnel to successfully remove the piece of the vertebral disc that is responsible for the pain in the patient’s lower back. Protruding disc surgery is covered by the NHS and is almost always done as an outpatient or at most, the patient will be discharged the following morning. Following the surgery, the surgeon will usually suggest the patient takes a long walk. If you need to pay for this surgery, consult your surgeon for an estimated cost, as the variables contributing to this make a ballpark figure for protruding disc surgery almost impossible.